Oh, it was incredible. It was very good. We had good crowds all the time, but I have to say they heard an organized program which first demonstrated low-fi, then hi-fi mono, and then going from mono to stereo. The people that attended it all knew the difference between all three. In the early spring of 1958 Carolyn and I picked up a new Porsche in Stuttgart Germany and drove it to Brussels Belgium to see the 1958 World’s Fair.To our surprise the truly unique, at that time, "high fidelity" component industry in America was not represented.The only display was of an inferior cabinet model phonograph.We marched out of the display determined to do something about it.Upon our arrival back in the United States we went to friends at the Christian Science Monitor who helped us make contact with the United States State Department officials in Washington, DC. On August 22, 1958 Carolyn and I, along with two friends George Petry and Bill Bell, unloaded our personal home sound system at the Brussels airport (photo).It can be seen that the two Klipschorns constituted a major part of the load. 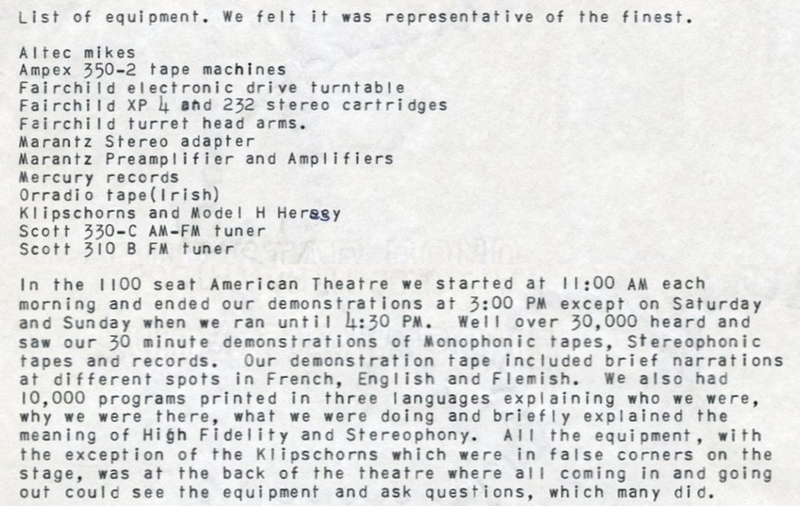 We were given the American National pavilion auditorium each afternoon for a demonstration of live versus recorded music The electronics were displayed on tables in the aisle at the rear of the auditorium. The two Ampex tape recorders, the Marantz preamplifiers, and power amplifiers along with the Fairchild turntable are visible in the photo. The two Klipschorns were placed on stage in artificial corners made of plywood. A Klipsch Hersey was used as a derived center channel (A-B). Every demonstration was played to full houses. Coming home in the fall I went to work for Paul Klipsch in Hope Arkansas, later to be identified as the hometown of Bill Clinton and Mike Huckabee, but it was always Mr. Klipsch that drew us back to Hope as its most notable celebrity. It's worth noting that 56 years later Klipschorns are still the epitome of the art, thanks to its basic solution of fundamental problems in bass reproduction, especially transient response, its inherent efficiency, and it's use of corners as the optimum place to excite a room's acoustic environment. Naturally this event became a key element in Klipsch advertising for many years. We are indebted to Don & Carolyn Davis for the majority of information on this event.